See where your limits take you. Give every day a chance to reach its potential. Highlander Hybrid generates as much as 306 hybrid system net horsepower, with up to an EPA-estimated 30 mpg city. Constantly having to search for a fuel pump is a thing of the past, and we didn’t have to sacrifice power or performance in the process. It has up to 3500 lbs. of towing power and is equipped with the capability of Electronic On-Demand AWD system with intelligence (AWD-i). It’s time to start expecting more from every drive. 4 Entune™ is a trademark of Toyota Motor Corporation. Always drive safely, obey traffic laws and focus on the road while driving. Services vary by phone/carrier. Functionality depends on many factors. Services subject to change. For enrollment and more details, see toyota.com/entune. Highlander Hybrid combines an efficient 3.5-liter V6 and an electric motor to produce 280 hybrid system net horsepower. At the same time, this powertrain offers an impressive EPA-estimated 30 city and 28 highway mpg,1 which helps give this hybrid SUV a Super Ultra Low Emission Vehicle (SULEV)2 rating. 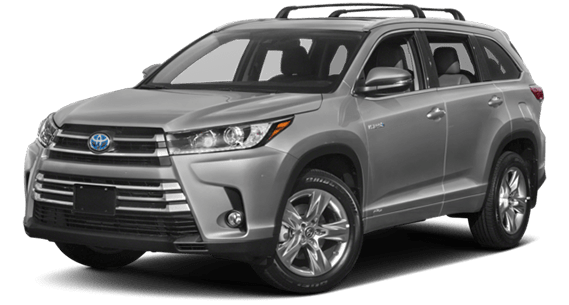 Highlander Hybrid’s Electronic On-Demand All-Wheel Drive with intelligence (AWD-i) is designed to help make any trek a sure-footed experience, with an electric motor that delivers instant torque to the rear wheels whenever you need more traction. 2 Meets Tier 2/Bin 3 Federal emissions standard. 3 Before towing, confirm your vehicle and trailer are compatible, hooked up and loaded properly and that you have any necessary additional equipment. Do not exceed any Weight Ratings and follow all instructions in your Owner’s Manual. The maximum you can tow depends on base curb weight plus the total weight of any cargo, occupants, and added vehicle equipment. “Added vehicle equipment” includes additional standard/optional equipment and accessories added by the manufacturer, dealers, and/or vehicle owners. The only way to be certain of your vehicle’s exact curb weight is to weigh your vehicle without passengers or cargo. There’s now a Highlander Hybrid for every type of family. The 2017 lineup has been expanded to include a hybrid version of Highlander LE, XLE, Limited and Limited Platinum. Let’s shine a light on style. Redesigned headlights now feature integrated Daytime Running Lights (DRL), amplifying the 2017 Highlander’s signature look. The all-new SE grade ups the excitement with its dark-black-accent headlights, while Highlander Limited Platinum has a powerful presence of its own with smoked-chrome headlight housings. Every Highlander gets all-new LED taillights for added visibility in the rear.